The advancements in computer technology since ALS was first introduced have provided us with a third generation of human simulator manikins. These lifelike, computer-model–driven manikins have pulses, heart sounds, breath sounds, and pupillary reflexes. They can develop bronchospasm with audible wheezing, hypotension, laryngospasm, laryngeal oedema, pneumothorax, and many other anaesthesia complications. Commercial airline pilots have didactic knowledge of how to manage their own life-threatening airliner emergencies, but they go one step beyond the classroom by requiring flight simulation emergency training in which they actually “fly” under the intense stress that the flight simulator emergencies provide. The availability of anaesthesia simulators has become more widespread in training programs, and their value in education increasingly recognised. 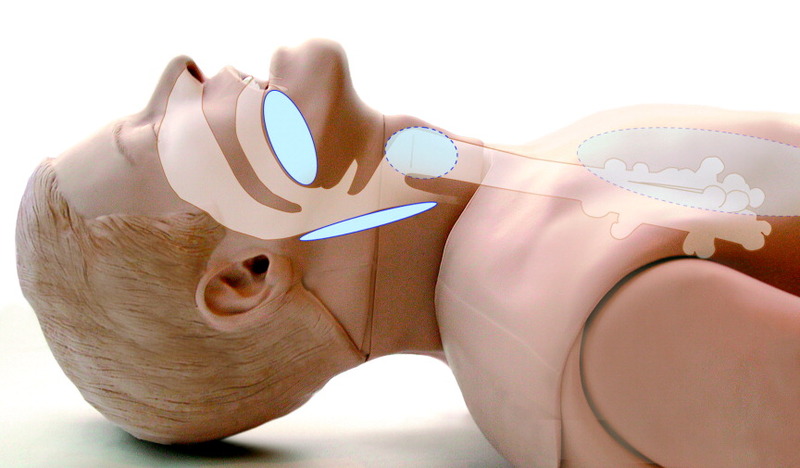 Indeed manikins are now used in the Primary FRCA OSCE to assess resuscitation skills. Click the link below to learn more about simulation. The new recommendations for 2005 are described as a 'consensus on science' and they reflect the growing recognition that different countries and regions have varied resources and needs. Previous Resuscitation Council (UK) guidelines have included three separate tachycardia algorithms: broad-complex tachycardia, narrow-complex tachycardia, and atrial fibrillation. In the peri-arrest setting many treatment principals are common to all tachycardias. For this reason, they have been combined into a single tachycardia algorithm. (you are required to register your name on the Advanced Life Support Group's waiting list for APLS).